It’s fair to say that Yeah Yeah Yeahs are one of my favourite bands of all time. I’ve wanted to see them live since I was a wee girl in Wolverhampton and now I’m a wee woman who has put all her hopes and dreams into the band standing before her.Basically YYYs had a lot to live up to when I went to see them for the first time. A decade long build up is a hard thing to live up to but they did obviously. It’s the Yeah Yeah Yeahs what else would they do. Everything was there, ready, in place for this girl to go crazy. Brian was keeping the beat going with his hard hitting drumming style frantically battling against a drum machine, Nick was stalking the corner of the stage looking cool and Karen was yelping and throwing herself around the stage like the old days. Either the guys knew a lot of their older fans would be attendance or they just loved playing their rare songs ‘cause both the 10×10 and the even rarer Shake It made it onto the setlist. The band had spared no expense on special effects so glitter fell from the ceiling and giant eyeballs careered through the crowd. It was great at first but got a little distracting after a while. The band has come to a place in their career where they shouldn’t have to rely on cheap effects to get the crowd going. The highlight of the night had to be Karen’s ritual dedication of Maps to the audience. The band eased their way into a slowed down, sparse version of the well known classic that caused couples throughout the crowd, including one right in front of me, to lock lips for no reason. Well, no reason except for love that is. 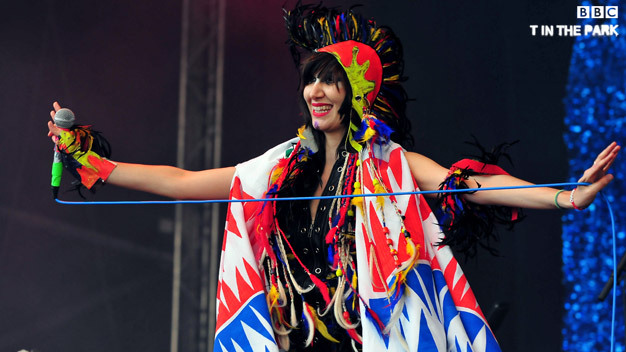 Tags: brixton academy, gig review, karen o, yeah yeah yeahs. Bookmark the permalink.